Trailing spouses: What female Ph.D.s teach us about lasting workplace gender inequality. Photo illustration by Lisa Larson-Walker. Photos by Thinkstock, Lambert/Getty Images. Sarah Stevens married a fellow grad student right as she was finishing a Ph.D. in Chinese. Together, they decided they would go wherever one person found a good job. Her husband got an offer first. “I feel like it’s always the way it turns out—the guy getting the job,” she said. Though she was not able to get a tenure-track offer in Oregon where her husband was, she was pleased to take a half-time position as the associate director for international programs that allowed her flexibility with child care. Then her husband’s program was cut, and he was moved into a department where he was far less happy. Something had to change, so he found a job at a university in rural Indiana, and the whole family moved. Suddenly, Stevens found herself unemployed in a new town. With a deteriorating marriage, two kids, and a quickly approaching 40th birthday, she filed for divorce. Like Stevens, about 70 percent of academics face the “two-body” problem, where both members of a couple have graduate degrees and wish to pursue tenure-track academic careers. Finding an arrangement where both people get to make equitable strides in their careers in relatively close geographic proximity (without moving to, say, Malaysia) is akin to winning the academic lottery. Absent such luck, one half of the couple has to become what is referred to as the “trailing spouse,” whose career goals take a back seat to their partner’s. This is where the most entrenched gender tendencies of our job market—where women put their partners’ careers first for the good of the family, ultimately sacrificing potentially high-paying work for years to come—haunt even the U.S.’s most educated cohort of women. Stanford’s Clayman Institute for Gender Research launched a large-scale study of dual-career academic couples in 2006. The results are alarming: “68% of all male survey respondents report that they consider their own career more important than that of their partner. Less than one-third of women did so.” Similarly, women list their partner’s careers as their No. 1 reason for turning down tenure-track positions. It may be tempting to write off female academics’ lesser career prospects as entirely self-inflicted. But academia is saddled with norms that disadvantage women, and it’s impossible to judge women’s choices without taking this context into account. Being married and having children compounds an already-existing gender disparity in academia wherein women, despite earning more doctoral degrees than men, are underrepresented in all but the lowest-ranking academic positions. While women are 7 percent less likely than men to get tenure-track positions, women with children under the age of 6 are 21 percent less likely than one without to be hired onto the tenure track. Similarly, a woman who is married is 17 percent less likely to be hired into a tenure-track position than an unmarried woman. Some women with Ph.D.s opt to become the trailing spouse in hopes of avoiding the “quiet desperation” of life as academic women. Chief among their concerns is work-life balance. Even when a university has family-friendly policies in place, female academics are sometimes reluctant to take advantage of them because they are fearful that asking for flexibility will make them look less serious than their male colleagues. This hesitation is not unfounded. In their 2013 book Do Babies Matter? Gender and Family in the Ivory Tower, Mary Ann Mason, Nicholas H. Wolfinger, and Marc Goulden found that “men who marry and have children are considered more mature and better able to handle their work, while women are considered less serious.” A recent study shows other biases hiring committees bring: women who have male partners are believed to be less committed, less willing to move, and thus less viable candidates than those without. Stevens still lives in Indiana and works in an academic administrative job she loves. However, she admits she sometimes gets “really full of resentment and bitterness” at the fact that her ex-husband makes significantly more than she does, and she’s now stuck in a town that might not necessarily afford the best professional opportunities due to child custody arrangements. Angela Ellis, an adjunct assistant professor in New York, found herself trailing her Ph.D. husband. 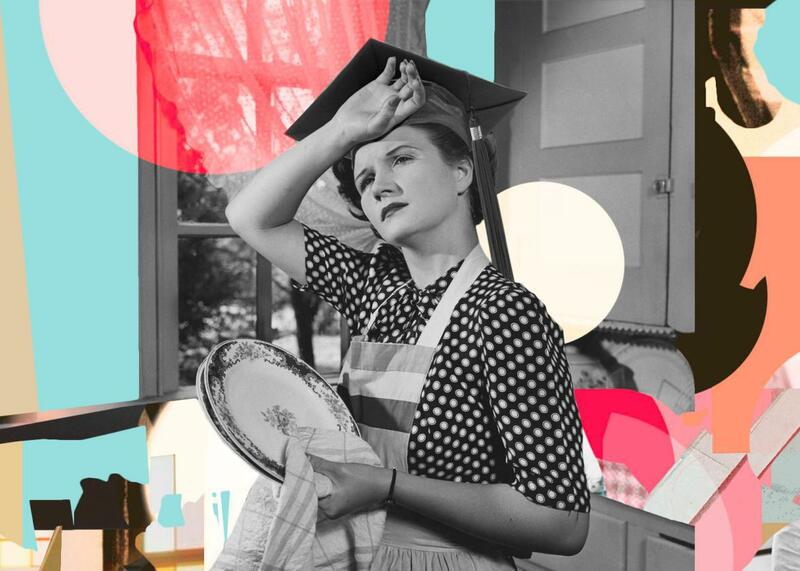 They’re still happily married, but the pressure and responsibilities associated with her husband’s position have left her handling the bulk of domestic labor: “We’re both equally bright, our Ph.D.s are from the same school, but I’ll never have a tenure-track job. Maybe I could have written two books, too, if I weren’t always putting another load of laundry in the washing machine or mentally keeping track of whether we have food for our son’s packed lunch the next day.” Her husband has offered to go back on the job market, but they are comfortable living where they do, and unconvinced that such a plan would lead to a positive outcome. Despite years of commitment to their chosen fields, these rigorously trained women are still putting their careers behind their male partners’ at disproportionate rates, and at great, long-term cost to themselves (not to mention at great cost to their disciplines, which will never benefit from their potential scholarly contributions). Though this “mommy-tracking” can appear as sheer “choice” (as the sole male respondent to a survey I put together about this topic insisted), gender bias leaves even the most educated women with few options. These patterns have a powerful pull even on women who consider themselves committed feminists. Ellis laments, “I’ve fallen right into the conventionally gendered patterns that I say that I oppose.” And without a profound workplace culture shift, academia will keep dragging women like Ellis and Stevens onto the well-worn trail where women’s careers are forever yoked to their husbands and children.